An architectural masterwork of glowing and awe-inspiring towers that soar above the rest, giving its privileged residents the finest views on Sentosa Cove. A landmark that stands sentinel at the gateway of a glittering Marina, this is seafront living that Singapore has never seen before. The inspired creation of intentionally celebrated award-wining architect, Wimberly Allision Tong and Goo Inc., The Oceanfront is the new benchmark in luxury seafront living. Just minutes from the downtown vibrance of Singapore, one of Asia's most exciting cities, is the exclusive residential enclave of Sentosa Cove. Among the world's most anticipated integrated marina precincts, Sentosa Cove is a gated community of seafront bungalows and condominiums. Poised as the tallest residences at Sentosa Cove, The oceanfront promises a splendid lifestyle filled with endless entertainment amidst spectacular beauty. With a full Marina, tree-lined driveways, boardwalks, promenaded, Sentosa Cove also features an exciting quayside complete with fine dining, shopping and more. A short drive from Sentosa Cove, you can experience the excitement of a multi-billion dollar Integrated Resort .A kaleidoscope of world-class leisure amenities, the future Integrated Resort promises a sophisticated mix of restaurants, boutiques and many other entertainment options for your family and friends. Minutes form your home are the manicured perfection of the greens and fairways in Singapore's most admires golf courses at the Sentosa Golf Club. Set amongst shimmering waters and lush greenery, these two 18-hole championship courses are amongst the best in the region. The Oceanfront @ Sentosa Cove features a host of luxurious facilities that are set against an exquisite backdrop of sun, sea and sky. Lush in landscaped gardens with an elevated timber deck, elegant walkways, delightful water features and so much more add a touch of magic to life here. A fully equipped gymnasium is designed to take full advantage of Marina views and a stunning, infinity-edged lap pool stretches into the horizon. 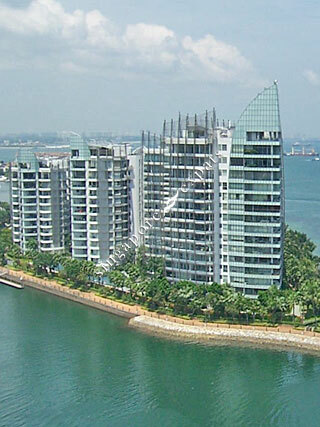 Your home at The Oceanfront @ Sentosa Cove is surrounded by sweeping vistas of natural beauty. With full length windows in the living and dining areas, you will enjoy the unique experience of true seafront living. Delight in the luxury of space when you choose from among the 264 exquisitely designed sky villas, sky suites, villas and 2-, 3- & 4-bedroo apartments. each impeccably designed unit has its own private lift lobby and most units have balconies - just perfect for a morning cuppa while enjoying the sunrise. The Oceanfront is the first condominium in Singapore to be fitted with the Hansgrohe Axro Citterio premium bathroom collection designed by Antonio Citterio, a world-renowned architect and designer who has worked with B&B Italia, Capellini, Cerutti and Bvlgari Hotel in Milan, amongst other famous brands. All bathrooms at The Oceanfront come fully equipped with Antonio Citterio's star design - a luxurious single level basin mixer - along with other quality fittings from the designer's collection. The sleek and stylish kitchen features the clean lines, design and functionality of premium, stainless steel Miele appliances. These include the cooker hood and hob, built-in oven, dishwasher and refrigerator. and to add a special touch to entertaining at home, every kitchen also comes complete with a Miele wine-cooler. Ocean living away from the busy jostling city, minutes walk away from Cold Storage & Quay Isle. Makes one feel so complete & at Peace .